Albuquerque, New Mexico. 2 June 2015: Optomec, a leading global supplier of production grade additive manufacturing systems for 3D Printed Metals and 3D Printed Electronics, today released photos and videos from its “What’s Next in Additive Manufacturing?” event held on May 13, 2015. 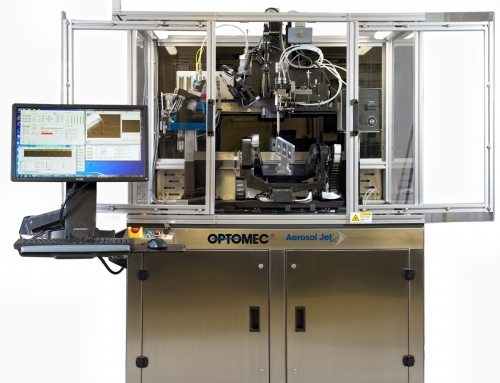 Optomec, along with America Makes, MachMotion, and TechSolve, jointly unveiled a vintage CNC machine tool equipped with advanced metal 3D printing capabilities. The upgraded CNC machine can perform both additive and subtractive processes on the same metal part, enabling cost savings and productivity enhancements for manufacturers of all sizes. More than 100 people came together at the TechSolve headquarters in Cincinnati for the unveiling of the hybrid machine and a panel discussion of industry experts. The panel explored the opportunities resulting from enabling additive manufacturing to seamlessly co-exist with conventional manufacturing methods on the factory floor. This project was funded by America Makes as part of its efforts to accelerate the adoption of metal additive manufacturing by US industry. The product development team included Optomec, who lead the development of the modularized LENS Print Engine; MachMotion, who provided expertise in additive/subtractive CNC controls; and TechSolve, who ensured machine tool optimization. America Makes is the National Additive Manufacturing Innovation Institute. As the national accelerator for additive manufacturing and 3D printing, America Makes is atructured as a public-private partnership with member organizations from industry, academia, government, non-government agencies, and workforce and economic development resources. Based in Youngstown, Ohio, America Makes is the pilot institute for up to 45 manufacturing innovation institutes and is driven by the National Center for Defense Manufacturing and Machining (NCDMM). With a focus on process improvement, machining, and innovation, TechSolve has been helping organizations of all sizes, and across various industries, grow and thrive for more than 30 years.